Resurrection Sunday is only a short three weeks away! 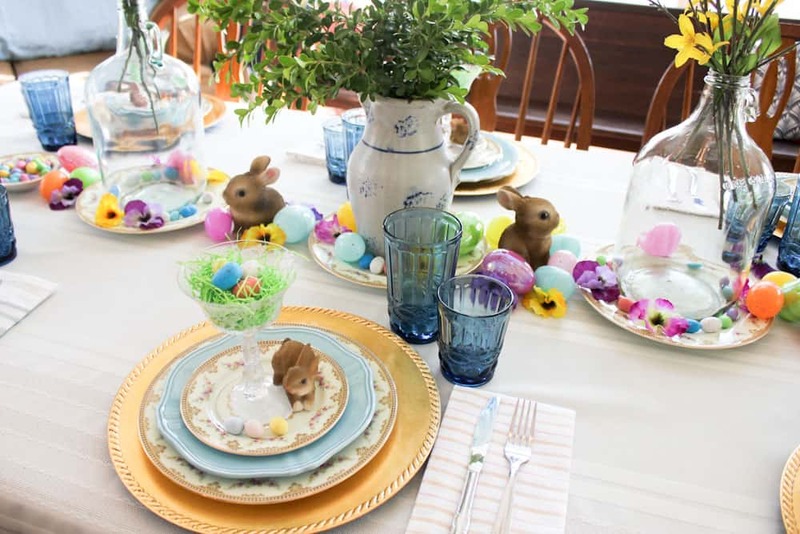 I wanted to share some ideas how to create a sweet Easter table setting with y’all. Putting together a beautiful tablescape is one of my favorite ways to set the scene for celebration! 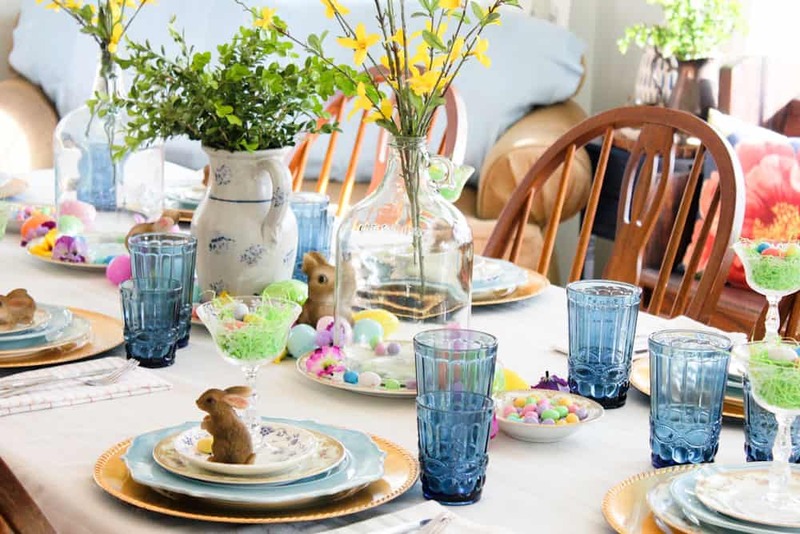 The inspiration for my Easter table setting came from a lovely set of pressed glass tumblers that I found while on a trip with my husband. We had gone to Navarre Beach for our 18th wedding anniversary and went to Pensacola to do some shopping. I was super excited to visit World Market for the first time because we don’t have one where we live. While browsing the aisles, I of course was drawn to a table full of discounted items. These beautiful glasses were marked 50% off so I grabbed six of them thinking ahead to our Easter table setting. Surprised by an Even Better Deal! So they were originally $4.99 and I got them for $2.49. It sounded like a good deal until I came across the very exact same glasses at Dollar General. They were so much cheaper and they even had the larger tumblers. I grabbed enough to make a complete place setting for eight people. I paid a fraction of the price that they would have been at World Market…even on sale! 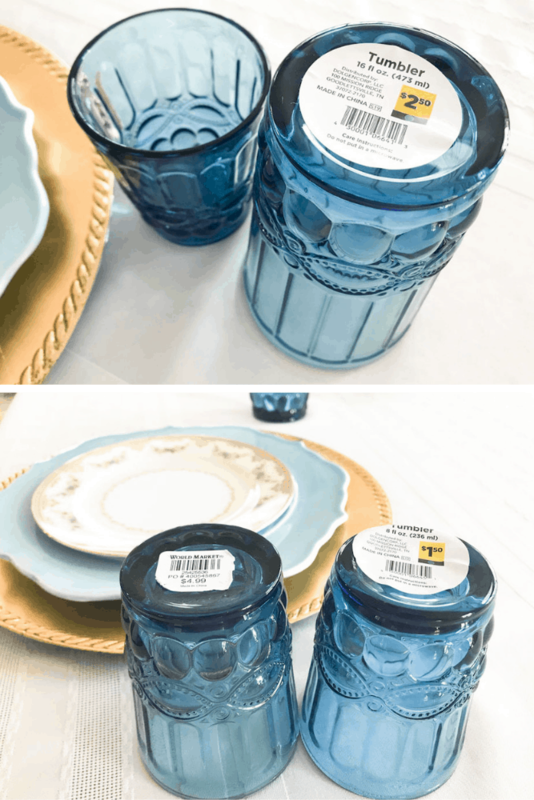 Blue has always been my favorite color so of course, these glasses became the inspiration for the rest of my Easter table setting. I love how the blue looks with the hand-thrown blue speckled pitcher that my Nanny gave to me. It’s kind of a rustic piece so it created a nice contrast alongside the delicate yellow and gold china that my mama gave me. Each place setting got a pop of soft blue from a set of plates that I got at Target. A lot of these items are the same pieces that I have used time and again for different holidays, but it’s amazing how you can style the same items with different colors and accents to create a totally different look. It works the same way as changing up your wardrobe. You just mix and match elements like you would with a neutral like gray trousers! You can get a lot more bang for your buck by rearranging how you fold your cloth napkins. This depends on the pattern, but these pink striped napkins have a simple, bold stripe on one side, and a gold and pink pattern on the other. This way you can easily change up the look! 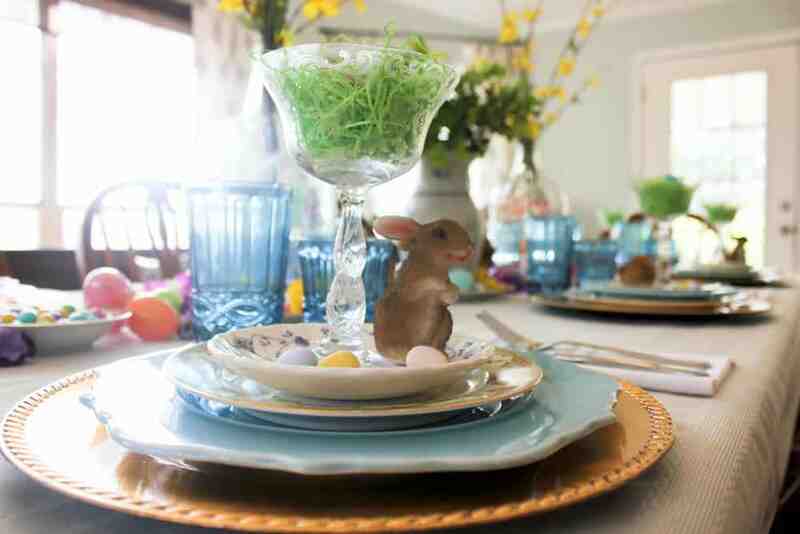 Add an Element of Whimsy to your Easter Table Setting! 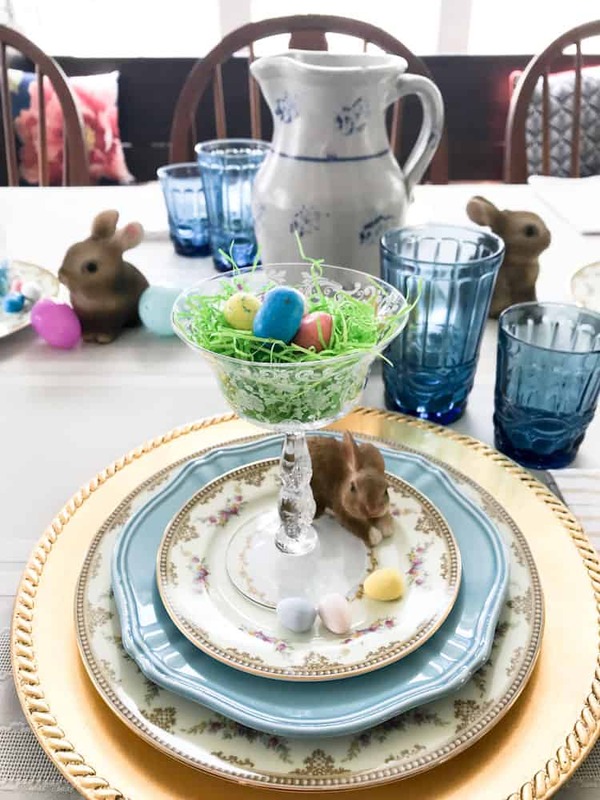 This year I added a really fun element to my Easter table setting. I found these little resin bunnies in the garden section at our local Dollar General. They add such a sweet little bit of whimsy to the overall look. Normally I like to use a lot of color in my Easter table setting. But the warm tone of the bunnies kind of lead me to look for more natural elements. So…the boxwood bushes got another trim! Haha! I love the hit of fresh green that reminds me that spring has arrived, and that even the earth is shouting praises for the Resurrection! 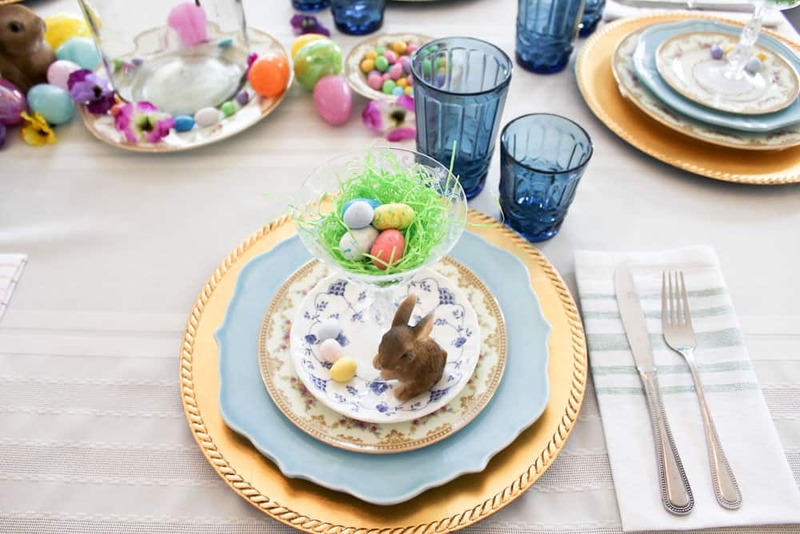 There is always room for Color in your Easter Table Setting! Even with the more natural elements in this Easter table setting, I am always going to have color play a major role. I added pastels and spring inspired tones with simple plastic eggs from the dollar store and egg shaped candies. 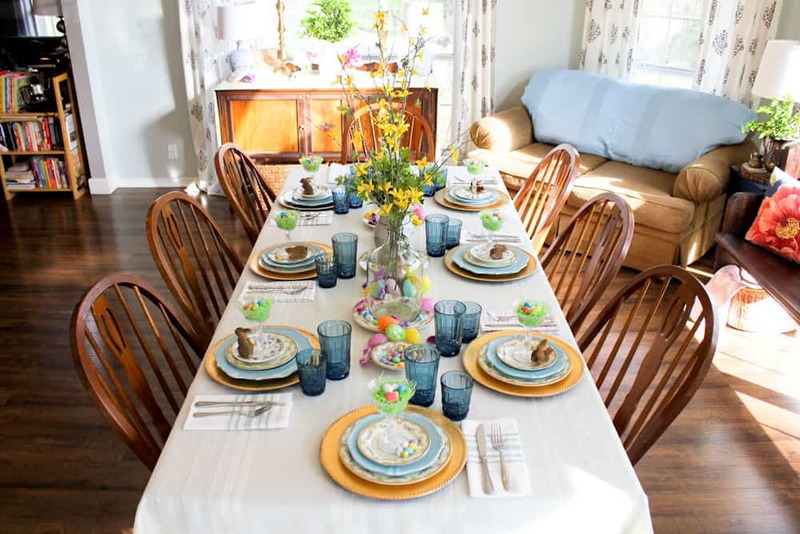 Here is one last idea I would like to leave with y’all to inspire your Easter table setting. We have often spoken of the beauty and dignity that women carry in being the hearth keepers of joy and celebration in the home. This is not just about a pretty table. The idea of creating a lovely space to inspire comfort and joy is an act of worship. Isn’t that a delightful thought?? Couldn’t we all use a good “antidote to despair” and a “wellspring of genuine gratitude”?? If celebration well practiced can invoke this kind of joy and gratitude for myself and the people I love, then sign me up!